The late Zen teacher Sodo Yokoyama gave a clear summary of his teaching in a letter to a friend in 1977. This is taken from longer excerpt in the excellent book, Living and Dying in Zazen by Arthur Braverman, which I recommend with enthusiasm. “Zazen” means “just sitting”, and is a Zen word for meditation. “Satori” means a sudden flash of awareness or awakeness; a brief experience of Enlightenment. “What a strange thing this zazen is. When we practice it, distracting ideas, irrelevant thoughts — in short, delusions, which ordinary people are made of, suddenly seem to feel an irresistible temptation to arise and appear on the surface. Then there is a desire to drive these thoughts away, in irresistible desire to which our complete effort is added. Those who don’t do zazen know nothing about this. Why is it that when we practice, deluded thoughts continue to surface one after the other? 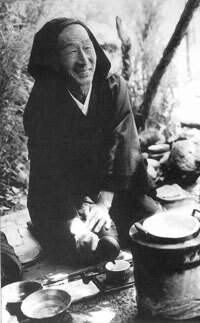 The reason, which we learn from Zazen, is that each one of us, from prince to beggar, is an ordinary (deluded) person. The attempt to drive these deluded thoughts away — delusion being so much nonsense (interfering with the happiness of oneself and others) — is also something brought home to us through zazen. We tentatively call this zazen that guides us in this way, ‘Buddha’. “According to this teaching, simply the awareness that you are deluded, which comes from practising zazen, makes you, in reality, a Buddha. It’s zazen that teaches us that we too are deluded, and hence delivers us from this delusion. When we actually practice zazen and look carefully at all the deluded ideas that keep popping up, we realize how ordinary we are and how little we have to be proud of or to brag about; nothing to do other than quietly hide away. This is, after all, what we truly are. “Satori is being enlightened to the fact that we are deluded. There is then the desire, however small, to stop these deluded acts. That is how ordinary people are saved by zazen. So we realize, beyond a doubt, our ordinariness through our zazen practice, and any departure from zazen (Buddha) will give rise to the inability to deal with these delusions and hence we will lose our way. We can say that the world has gone astray because it can’t deal with its delusions…All the troubles in this world, political, economic and so forth, are created from situations in which the awareness of one’s ordinariness is absent. “The devil — that is, illusion — when seen as the devil, can no longer exhibit its powers, and disappears of its own accord.